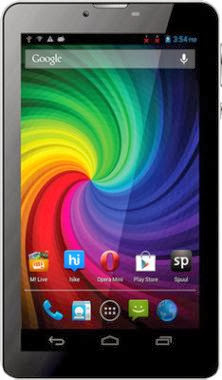 Micromax Funbook Mini P410, the company’s first tablet with dual Sim support and it is now available on online retailers. Recently Micromax has launched its first Canvas Tablet in Funbook series and now comes with Dual Sim tablet in Funbook series. It comes with 7-inch capacitive touch display with the resolution of 1024x600 pixels. It runs on Android 4.1 Jelly Bean operating system and powered by 1 GHz dual core processor. Micromax Funbook Mini P410 has Dual SIM card slots with 3G voice calling support. It features a 2 MP rear camera and 0.3 MP front facing VGA camera for video calls. It comes with 1 GB of RAM, 4 GB of internal memory and external memory extended up to 32 GB. The tablet has the connectivity of 3G, Wi-Fi, Bluetooth and GPS and it packed with 2800 mAh battery. The Micromax Funbook Mini P410 comes in white color and it is priced at Rs.8820 on online retailers. The tablet will be launched officially soon but you can pre-order from below sites.